Now you can upload presentations to SlideServe easily with PowerFlashPoint software. 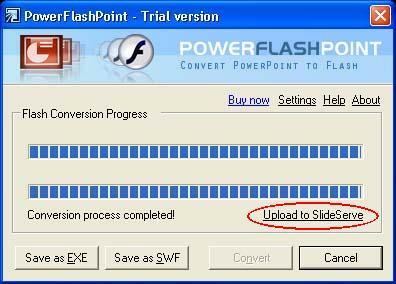 PowerFlashPoint is a PowerPoint add-in for SlideServe. Upload to SlideServe easily with PowerFlashPoint software. There is no file size restriction while uploading presentation through PowerFlashPoint software.